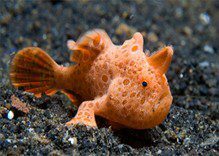 Welcome to Khao Lak Explorer PADI 5* Dive Center in Khao Lak, we propose you a wide range of Khao Lak liveaboards to Similan Islands National Park departing from Khao Lak or Phuket. 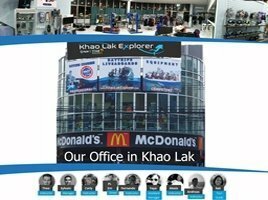 Our Khao Lak Dive Center is located right in the center of Khao Lak, in a convenient location, where we will tailor made your Khao Lak diving adventures for the best khao lak scuba diving holidays and fun. 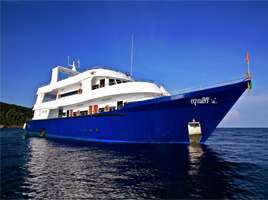 Our Khao Lak liveaboard schedule is prepared specially for your holiday cruise to the Similan Islands National Park. We always have the best service in mind and this is what makes the difference between us and the other Similan dive centers. Khao Lak Similan Islands dive season is usually starting from 15th October to 15th May. Outside of those dates the marine park is closed to public. Diving in Khao Lak is only possible between those dates. Our knowledge about the Similan islands and Khao Lak area will guide you through your booking. Our Khao Lak Similan liveaboards offers great comfort for the best value. You can be sure that we will provide the best service and dive equipment. All your questions will be answered within 24 hours. 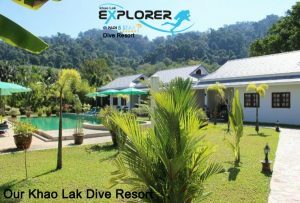 At Khao Lak Explorer we have our dive resort, located near Khao Lak center, it’s the perfect place to spend a few night or longer before and after your liveaboard or during your diving daytrips or dive courses. Away from big resort, our Khao Lak dive resort has a more friendly/family style resort approche, with 8 large air-conditioned rooms with pool view and private bathrooms. 2 Swimming pools, 1 dedicated for scuba diving with a shallow part and a deep park and 1 for relaxing while enjoying the mountain view. We are close to restaurant, 5 minutes from the markets and 1 km from the beach, you can easily walk anywhere. Come join us, lay near the pool, sit back and relax. Balance regulator, Dive Computer for liveaboards and more! Friendly, Safe and Fun ! Khao Lak Explorer Dive Center is a certified Shark Guardian dive center, participation in the shark conservation and awareness program. Our dive team help gathering statistic about shark sighting at the Similan islands national park, also propose presentation about sharks behavior, habitat and characteristics of each species. At our dive center office you can find apparels from Shark Guardian and all sales goes toward conservation and awareness program to teach children around the world why keeping the sharks in our oceans are important. Khao Lak liveaboard diving is a unique experience. Your cruise will depart in the evening to the Similan islands. You will wake up with the amazing sunrise over the Similan islands ready to scuba dive on-board our khao lak scuba liveaboard. As a Khao Lak diving PADI 5* similan dive center, our dive instructors are all well trained with years of scuba diving experience in the Similans. 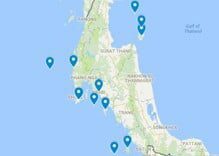 Our Dive Center in Khao Lak has been founded in 2010 by a group of passionate dive instructors who felt in love with Khao Lak and the amazing scuba diving at the Similan Islands national park. We can be your One Stop Dive Operator for your holiday in Khao Lak; from diving daytrips, scuba liveaboard, to snorkeling and land excursions. We offer all you need for the best holiday in Khao Lak. TAT Licenced. 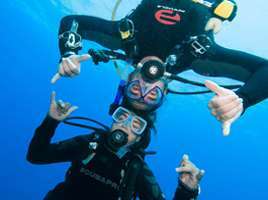 Highest standard of training and safety during our liveaboards, scuba diving daytrips or PADI scuba courses. Diving liveaboard is a magical experience. If you try it, you will love it. Wake up with view on the tropical islands of the Similans is a must see. Dive liveaboard will save you time and you get more dives for your money compared to doing day trips. On our Khao Lak liveaboards you will have the best time ever, wake up, dive, eat, sleep, make friends. Our comfortable liveaboards cruise to the Similan Islands, Koh Bon (Manta Point), Koh Tachai, and Richelieu Rock will provide you with the best service and most professional team. Join our scuba diving daytrips to the Similan islands national park with the speed catamaran or speed boat. The beautiful dive sites of the Similan Islands, Koh Bon (Manta point), Koh Tachai and the famous Richelieu Rock await you!!! Nitrox is available onboard and we limit to maximum 18 divers. Our diving daytrips are suitable for both divers, non-divers and family with children. We keep the dive group small (4 or 5 divers per guide). All diving courses and fun dives are done in small groups of 4 or 5 divers maximum per guide and available in a number of languages. Our divemasters and instructors are all PADI qualified with years of experience. They will share their knowledge of the underwater world and go the extra mile to make sure your Similan Islands diving experience is safe and unforgettable. Come enjoy the beautiful Similan islands with us. Our Speedboat Similans snorkeling trip will take you to the Similan Islands, Koh Tachai, Surin islands or Koh Phi Phi. We pick you up straight from your hotel in Khao Lak or Phuket. We have as well overnight stay on the Similan islands or Surin Islands in either bungalow, tent, or on the boat. 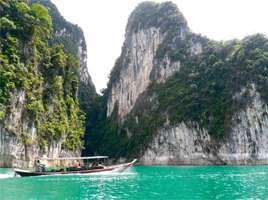 Stay for 2 to 3 days on a Thailand paradise islands and get the fullest island experience. Our wide range of land tours around Khao Lak area will make you discover the beautiful scenery and landscape. All our Khao Lak tours are great for couples and families. We take care of everything for you, from morning pick up until back to your hotel. Friendly tour guide and nice lunch, our land tour packages are not to be missed. Similan Diving Season 15th October to 15th May ! The Diving season is on, it’s time to plan for your liveaboards and daytrips to the best dive sites of Thailand. Joins us for an experience of a lifetime ! When we are not diving, we are on tours ! Joins our Khao Lak tours all year around ! Nature Lovers will be pleased, Khao Lak and Phang-nga province has a lot to offers in term of nature and wild life. Our tours are made in small groups for more fun! Khao Lak is the best dive destination in Thailand to dive the Similan Islands National Park. It is the main hub and the closest town for departure to the Similan islands national park (Department of National Parks). Khao Lak have a lot to offer with local dive sites full of marine lives, nature trails and treks, and of course amazing beaches perfect for vacation. 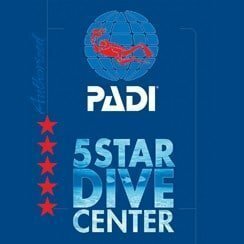 Looking for diving other places in the world? 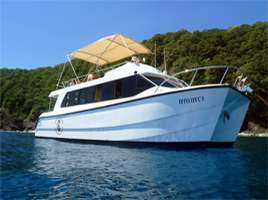 Check out Komodo diving liveaboards and Burma liveaboards we highly recommend it. You are welcome to contact us anytime to ask about our Similans diving packages or tours. Your scuba adventures can start here at our PADI Khao Lak Dive Centre. Our dive center has a huge retail section of diving and snorkeling gear, and all you need for your scuba diving trip and the Similan Islands tours. Khao Lak is a peaceful village on the west coast of Phang-nga Province. Great for nature discovery and relaxing. 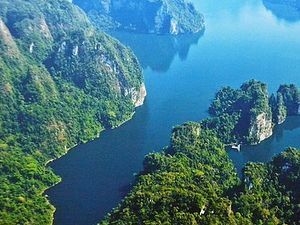 Khao Lak is very closed to Khao Sok National Park where we provide Khao Sok land tours and Phang-Nga Bay tours. Our tours are ideal for families and couples who don’t want to stay in the big city of Phuket. White sand beach and beautiful sunset await you in Khao Lak. With our wide range of Khao Lak scuba diving trip, Similan islands liveaboards and land tours, Khao Lak Explorer liveaboard is a one stop experience for your holidays in Khao Lak.